Does This Mean We’re Safe? Stocks bounced back, reclaiming a big chunk of Wednesday’s losses. Volatility remains insane as today’s 35-point intraday surge nearly matches yesterday’s 40-points intraday slide. While today’s third bounce off of 1,990 revives bull’s confidence, it is hard to feel good about a market that whips around 2% a day. Boring markets are healthy and bullish, but this market is anything but boring. We are only three-percent from all-time highs, but this volatility shows uneasiness creeping in. The Wall Street Journal reports intraday price ranges have swelled 50% this year as compared to 2014’s more sedate trade. Yet the VIX remains under its 10-year average of 20, showing lower than typical levels of fear. And not only is the market near all-time highs, we are also trading at premium forward earnings multiples versus historic averages, 17 vs 14.6. Record stock prices, increasing realized volatility, low implied volatility, and stretched multiples; makes you wonder if smart money is buying or selling here. Okay, I admit that was a rhetorical question because the answer is obvious. Stocks took bullish, blowout earnings from AAPL and turned them into a gut wrenching selloff. When the market crumbles on good news, you know we are in trouble. Some blame the weakness on the Fed’s midday policy statement claiming the economy is expanding at a “solid pace” and job gains are strong. Funny the world we live in when great news triggers a 40-point intraday selloff. But this shouldn’t surprise regular readers of this blog. For a while we’ve noted the weak demand every time this market tried to rebound. The elevated volatility is also a grave concern because it tells us the market’s personality is changing. That doesn’t mean we are headed for a 2008 style collapse, but we shouldn’t automatically expect every dip to be a buying opportunity. We knew this pattern couldn’t last forever and this time the weakness feels different. Today’s selloff closed above key psychological support at 2,000, but the market closed before the late-day sell off could take us any lower so I’m not sure that qualifies as holding support. There is a lot of pressure on bulls to get this turned around Thursday. 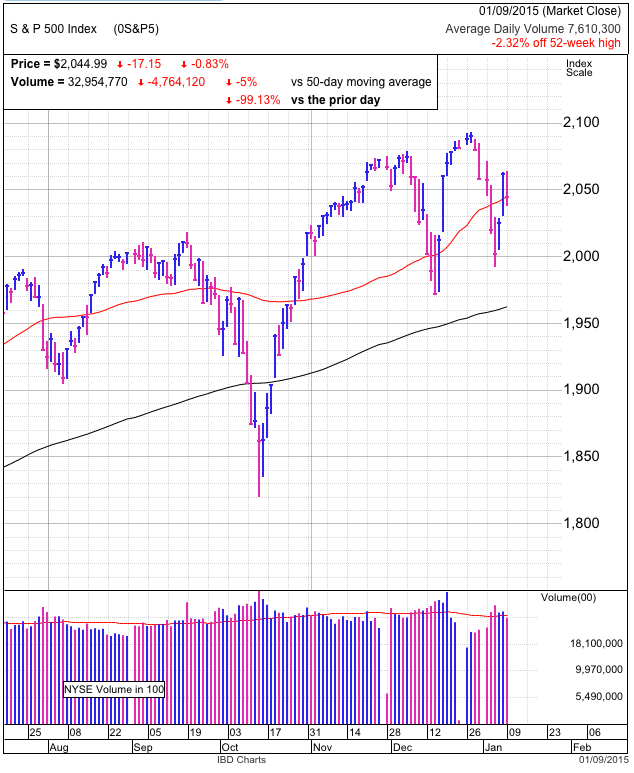 If we break under 2,000 support, December lows and the 200dma are the next stop as formerly confident and complacent bulls turn into scared sellers. While I remain skeptical of this market, I will have to reevaluate my outlook if the market bounces and breaks through overhead resistance at 2,060. No doubt Thursday will be an interesting and insightful day. Stocks stumbled on a combination of disappointing economic news and weak blue chip earnings. We crashed through technical support at the open, recovering some of those losses by the close, but not enough to push the market back above support. It is a strange world we live in when markets rally on seemingly devastating news for Euro stability, but then a hodgepodge of obscure economic indicators and company earnings take the market’s legs out. 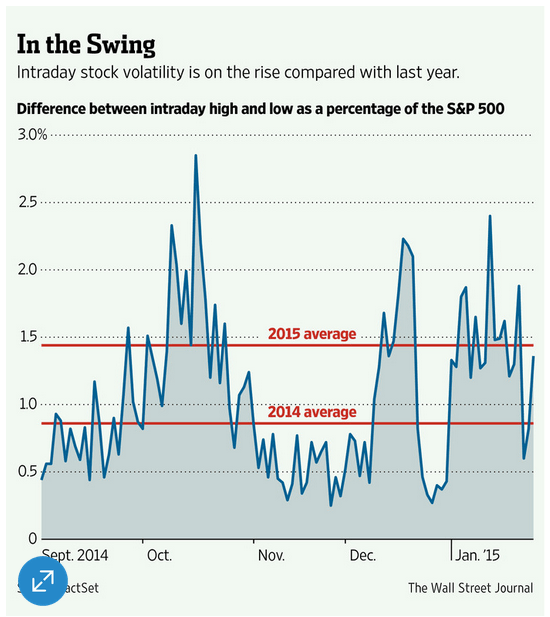 Volatility has become par for the course and nothing should surprise us anymore. The thing that troubles me is we have seen very little volatility in the market’s steady ascent from the 2011 lows. For a long stretch, we could count all the 1% moves on our fingers. But more recently, a 1% move is benign and more often we are surging and crashing from day-to-day. It really feels like the market’s personality is changing. If that’s the case, it means we are going from steady up trend to something else. Maybe that’s choppy sideways trade. Maybe it’s the long-awaited correction. Or maybe we explode higher in one last surge before collapsing. Only a few percent from all-time highs, it is hard to conclude which of these outcomes is happening, all we can say for sure is this feels different. Index futures are up after Apple’s blowout earnings, but the market decoupled from Apple a few years ago and the two often trade independently. A big move for Apple doesn’t automatically raise all boats in the S&P500. Outside of a brief pop at the open, the Apple story will become a single stock event and the rest of the market will quickly return to whatever else has been driving it recently. 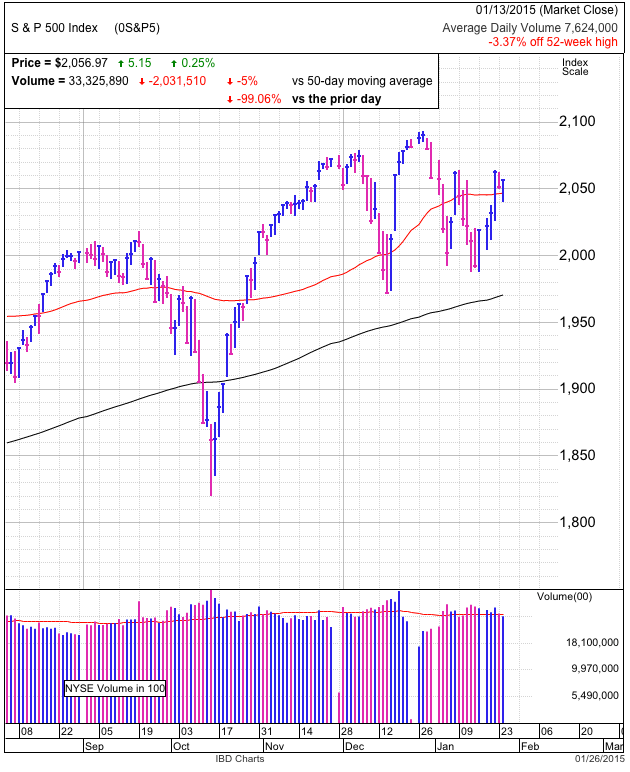 Technically, if the market cannot reclaim 2,050 by Wednesday’s close, that shows we are running out of buyers and should prepare for a test of the 200dma. This the time for bulls to show they are still in control. If they cannot, lookout below. Stocks bounced back from opening weakness following the Greek elections. While this result significantly increases the chances for a “Grexit”, we’ve been down this road before. Last time selling Greek uncertainty was a mistake and it appears traders don’t want to be fooled a second time. Headlines that triggered a wave of selling a few years ago, barely budged the needle today. Two mitigating factors are the election’s result was widely expected and most institutions have hedged their exposure to Greek default. So it’s not a surprise the market’s reaction was so muted. Of course the thing to be aware of is the lack of a selloff leaves us vulnerable if the situation devolves and is worse than expected. But just because we don’t have to worry about Greece doesn’t mean we have nothing to worry about. The market is up nearly 100% from the 2011 lows and anyone betting on this market is fat, dumb, and happy. While the market can always continue higher, it is getting harder and harder to find cynics to convert into believers. Markets top when everything looks the best because that is when everyone has already bought all the stock they can. Trading near record highs, it is hard to identify the next buying catalyst since there is so little fear. While we could see a temporary surge if we break through recent resistance at 2,060, that momentum will likely only carry us to previous highs near 2,100. After that it is hard to figure out what is going to get those that haven’t bought yet to start. If we run out of demand, that leaves us with two outcomes, an extended trading range, or the larger selloff everyone’s been predicting since 2011. If we hold 2,050 through Wednesday, then we will test the old highs. Fail and prepare for a swift ride to the 200dma. Stocks slipped for a fifth consecutive day as overseas concerns dominated financial headlines. After three years of currency manipulation, Switzerland gave up and let the franc float. It exploded higher, catching many traders and institutions off guard. While this move won’t have much of an impact on US earnings, it affects the financial system. Traders who have margin calls in one asset class, raise capital by selling other assets, often those showing the biggest gains. That means we could see some liquidation pressure on US equities. But bigger than just margin calls, this also affects sentiment. We went from all-time highs a few weeks ago, to obsessing over the half-empty side of the glass. Since every dip has been a buying opportunity, many owners are complacent and not worried about headline noise. The market bounced before and they assume it will bounce again. That’s why we haven’t seen huge waves of selling yet. It also means there are a lot of potential sellers still hiding in the market. Currently overnight futures are down nearly a percent. If this weakness holds to the open, that puts us near December’s lows. Break that and previously confident owners will start getting nervous. Not far below is the 200dma. Undercutting both of these key levels would trigger a large wave of selling and finally form a capitulation bottom. And that is the bullish scenario. Things get ugly if we crash through 1,950 without finding a bottom. That’s when panic selling takes over and we retest October’s lows. Stocks gapped higher at the open, but buyers failed to embrace the surge and we crashed into the red by early afternoon. It is difficult to come up with anything constructive to say about this price-action. The market gave bulls the perfect kick-start to setoff a short-squeeze and trigger another wave of dip-buying. If we were oversold, that is exactly what would have happened…but it didn’t. 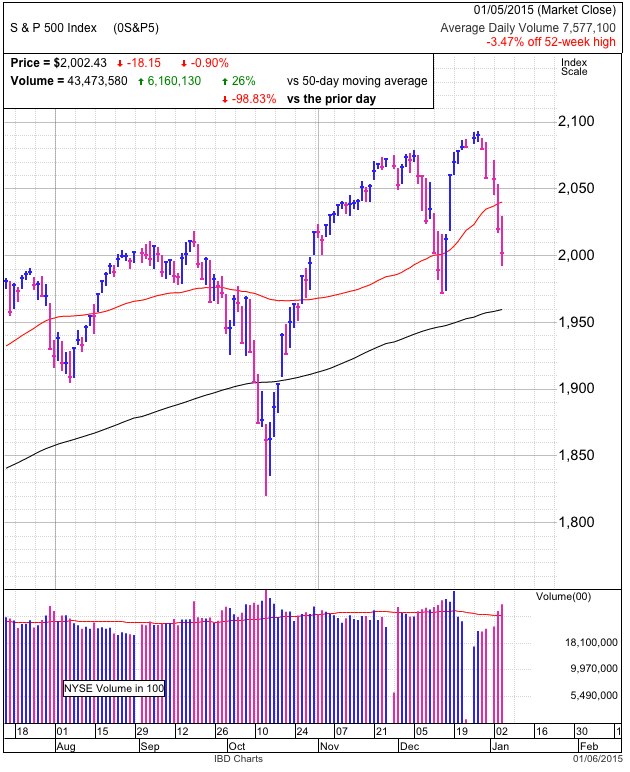 The obvious takeaway is this market is not oversold and we are not poised to rebound. That means we still have more downside before this correction is done. While today’s volume was higher, this wasn’t capitulation. We didn’t undercut recent lows and even though the intraday move was more than two-percent, the closing loss was a barely noteworthy quarter-of-a-percent. The only people who noticed the enormity of today’s move were the ones who follow the market tick-by-tick. To everyone else, this was another uneventful day. The market is searching for direction. While we are several percent off the highs, we are also making a series of higher-lows. 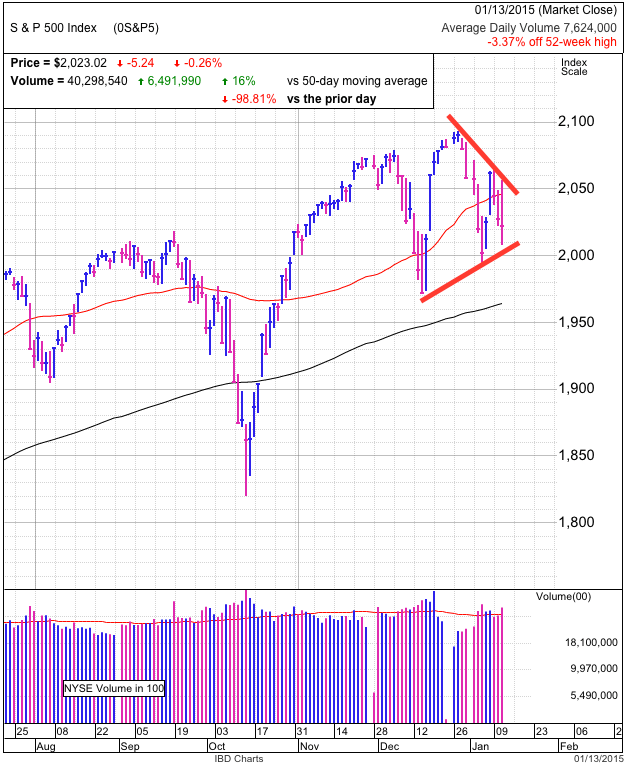 This pennant pattern can only last so long before the market has to breakout to either the upside or downside. This morning we stubbed our head on the high side, but we also found afternoon support on the low-end. For all the reasons I listed in previous posts, it looks like we have more downside ahead of us. 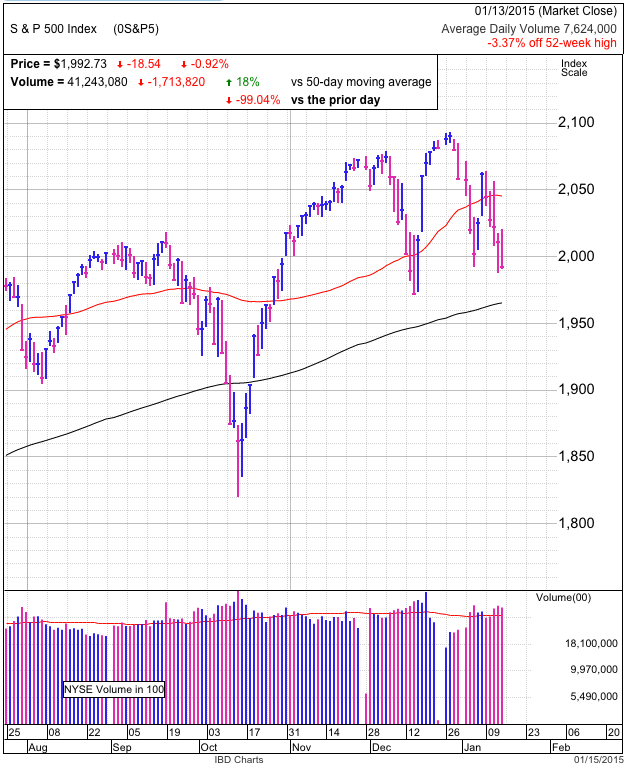 Breaking 2,000 will set off a wave of selling that takes us down to the 200dma. Fail to hold that and a retest of October’s lows is in the cards. While this could be a plunge over a few days, it could also be a slow grind lower over several months. We will see what happens in coming days, but it is hard to get excited by anything the market is showing us since logging new highs two weeks ago. Stocks tumbled, unimpressed with a stronger than expected employment report. Many pundits and talking-heads blamed the weakness on lagging wage growth, but that is a fairly obscure detail to to trump the headline numbers and derail a two-day rebound. It is worrisome when markets ignore a bullish headline and instead fixate on a minor detail buried in the report. There was more than enough good news to launch us higher if that is the direction the market was poised to go. Since we sold off instead, that tells us the market is not in the mood to go higher and we need to be prepared for further weakness. When good news cannot move us higher, what will happen when we get some legitimate bad news? 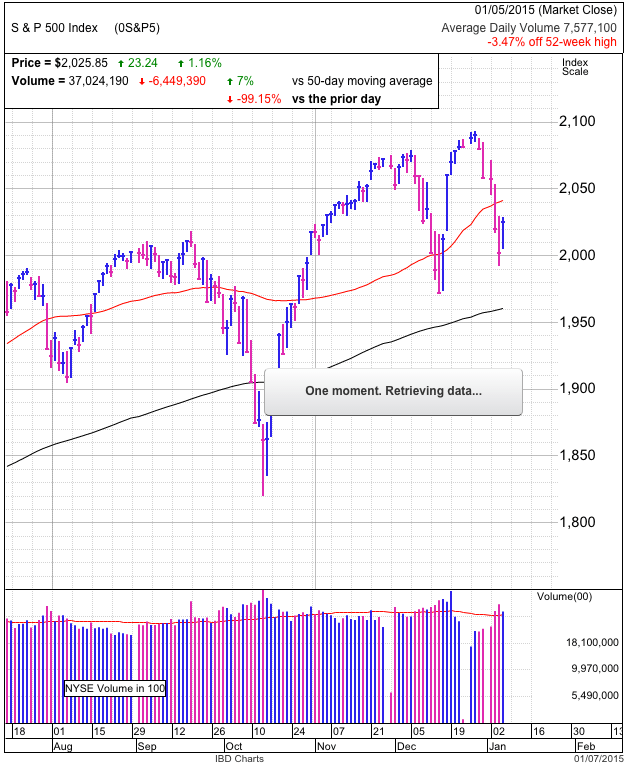 Technically, the market slipped back under 2,050 and is resting on the 50dma. Volume was the lowest in five days, showing not a lot of traders joined in todays selling. That can be interpreted two ways. Either owners are not interested in selling and we will bounce soon. Or, few people sold and there is still a mountain of supply waiting to hit the market. Since complacency is the rule these days, I fear the next trigger that turns confident owners into fearful sellers. 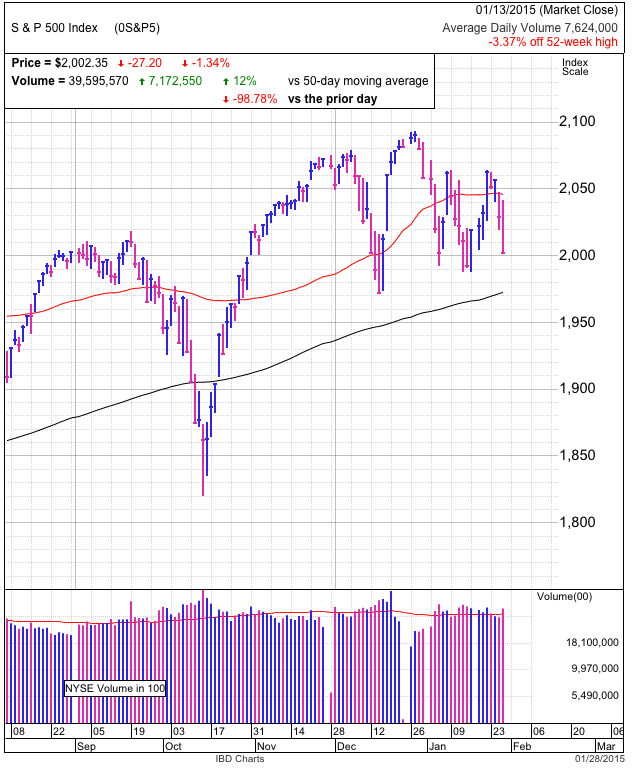 Stocks exploded higher as the S&P500 retook the 50dma and 2,050 technical level. While the price move was impressive, a similar surge in volume was conspicuously absent. That tells us the rise was more due to a reluctance of owners to sell than a huge wave of buying. Sentiment’s been swinging just as wildly as price. 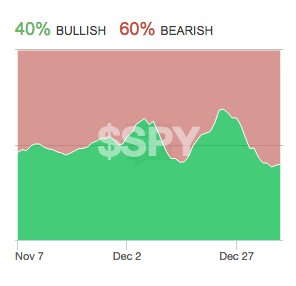 Stocktwit’s SPY sentiment went from 68% bullish in late December to 38% earlier this week. Along with price, it bounced back decisively to 50% in recent days. AAII investor sentiment has been on an equally volatile ride, up 10% last week and then down 10% this week. The lag in the AAII poll means most of the responses came before Wednesday and Thursday’s impressive gains. If the survey was real-time, I’d expect a similar resurgence in bullishness as we saw on Stocktwits. Another interesting nugget from AAII is while sentiment is down, equity allocations in December haven’t been this high since 2007. It appears individual investors haven’t owned this much stock since the top of the last bull market. Contrarian or not, that should give anyone pause. Friday morning we get monthly employment, but few are worried about it. That means a decent result is already priced in and we shouldn’t expect big gains due to a strong report. Unfortunately the opposite is not true. The complacency about employment means we are vulnerable to the downside if the market is blindsided by anything unexpected. Personally I expect another respectable employment number to follow the equally impressive US GDP we’ve seen. In the United States, everything looks great and we have little to be concerned about. But that is exactly what makes me nervous. Bull markets run out of gas on good news, not fear and anxiety. Between the bullish equity allocations, general sense of wellbeing, and increasing volatility, that is enough to make this buy-the-dip guy think twice about buying this dip. This time feel different. While we could easily make new highs in coming days, it just doesn’t feel like the risk/reward is on the dip-buyers side anymore. Can We Buy the Dip Yet? 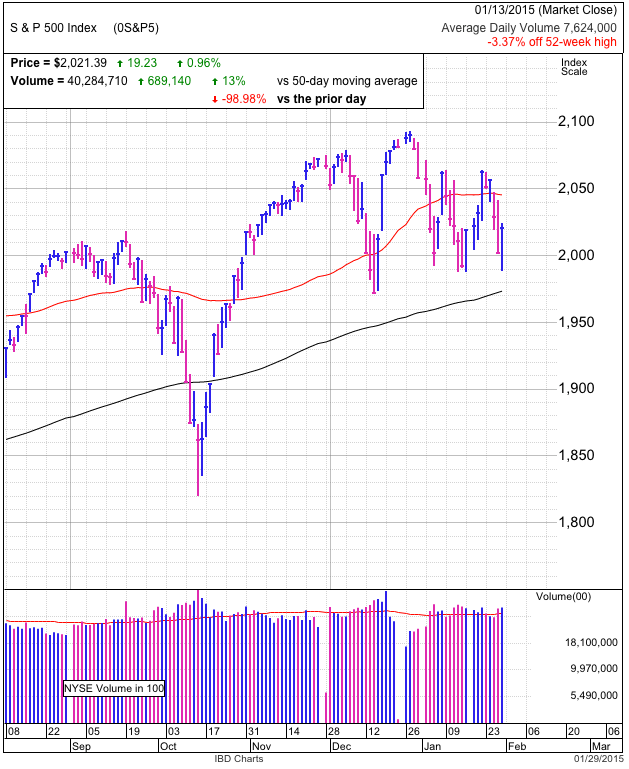 Stocks rebounded and a sigh of relief spread across the market as another crisis was averted. At least that was the initial reaction to Wednesday’s bounce off of 2,000. If this was last year, then we’d have a green-light to buy the dip with reckless abandon. But that was back when pessimism ruled and underweight fund managers were forced to chase a market that was quickly leaving them behind. Can we say the same conditions exist at the start of 2015? The change in calendar gives fund managers three-months of breathing room before they are required to report positions and performance to their customers. There is far less pressure for cautious managers to chase since they now have time on their side. As for pessimism, it is hard to get the market to worry about anything since investors have a ready-made excuse for every concern. This is a dramatic reversal from the days when an economic boogeyman was hiding around every corner (Cyprus, Taper, etc). Every rally ends and so will this one, but what we really want to know is if this is that time. 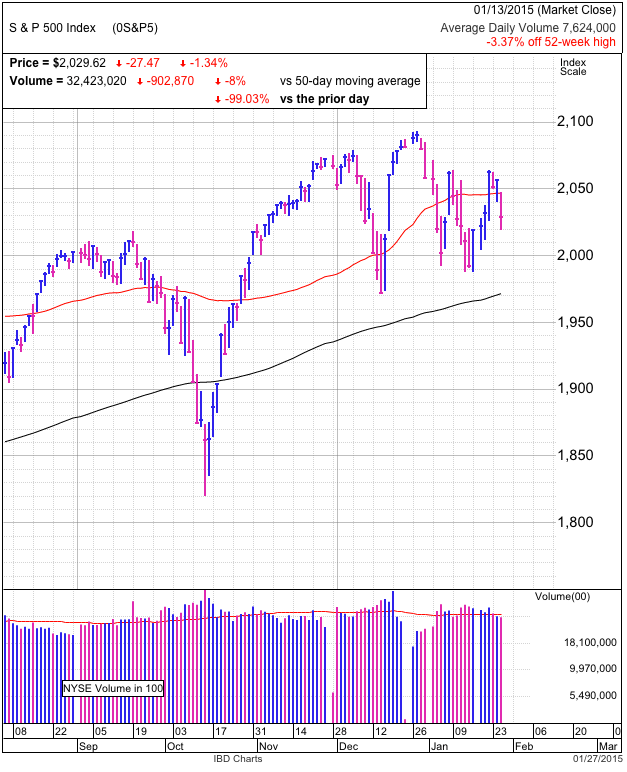 Dip-buying has become so routine that we will easily coast back up to the 50dma and 2,050 region in coming days. What happens next holds the key to where this market is headed. If we smash through 2,050, then the Teflon rally continues and we have nothing to worry about. If we struggle with 2,050, then it is time to get defensive, very defensive. I’ve been behind this rally for years, but increasing volatility makes this time feel different. I want to see this run continue, but failing to make new highs will tell us the trend is changing. Can Both Bulls and Bears Be Right? Another brutal day for the market, this time slipping under prior support at 2,000. The saving grace is we reclaimed this technical level by the close, even if just barely. Volume was higher than yesterday and well above average. No doubt the continued weakness and violation of a widely followed technical level triggered a wave of stop-loss orders, causing this surge in volume. Timeframe and timing are everything in the market. In a situation like this, both bull and bear can be right. A nimble dip-buyer can make a quick buck when this selloff bounces on Wednesday or Thursday. But the bear could also be right when the rebound fizzles and the selloff continues next week. Sentiment on Stocktwits SPY boards has been all over the place. Last week it was oozing with 68% bullishness, but a few short days later it flipped on its head with 61% bears boasting about the imminent collapse. We need to remember this is primarily a measure of day-trader sentiment. While a very active group, they are small and cannot sustain directional moves without the support of big money. This Stocktwits sentiment skew likely means we are getting close to near-term bounce, but we need to widen our lens if we want to figure out what happens next. That means looking at investors with a longer time horizon. There have been countless 2015 predictions circulating the financial press and the vast majority of pundits and big money managers expect this to be another good year. But the thing to remember is people naturally talk their book. If they are bullish on the market, then they are already fully invested. Where we run into trouble is when everyone is bullish, that means few are left to buy the market and keep pushing it higher. We’ve gotten used to sharp selloffs followed by equally fast rebounds. If the market finds a floor Wednesday or Thursday, expect the dip-buyers to rush in and send us back to the 50dma and 2,050. But since this trade is getting a tad too obvious, be prepared for the relief to be temporary. 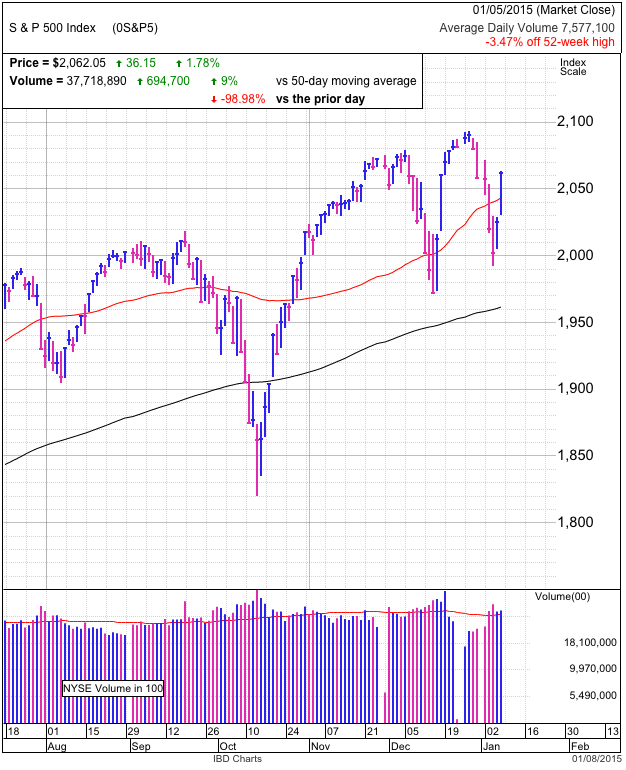 The market is split in two, diametrically opposing camps, bulls expecting us to continue marching higher and bears predicting a devastating collapse. The third, and most widely overlooked option is a slow grind lower with countless head fakes along the way to zing and humiliate overly aggressive bulls and bears.